This exceptionally clean, 2 story home has been fully renovated throughout including new furniture in every room. No need to worry on those hot, humid nights, this house has Central Air! This year-round home is located close to many wonderful restaurants, shopping, golf courses, miniature golf, go carts, and a short walk away from the well known Sundae School Ice Cream Shop. Our home has a large deck with furniture and a great private backyard for the kids. 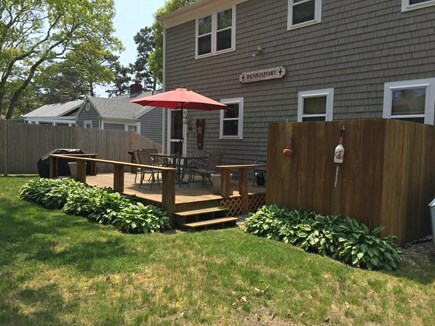 The house is nestled in a quiet neighborhood, just a 5 minute walk to Sea Street Beach on Nantucket Sound -- the beach has public rest rooms. The first floor of our home has a living room for those of you who enjoy reading a good book in a quiet place. But for those of you who enjoy a good movie we have a Den with a TV/DVD/VCR that can seat several people comfortably. Enjoy cooking a feast for dinner after a day at the beach in our fully equipped eat-in kitchen with new appliances. There is also a newly renovated full bath and master bedroom on the first floor. The second floor has two over sized bedrooms that sleep 4 people in each room and a second newly renovated full bath. Each bedroom on the second floor has its own TV/DVD. No one needs to fight over watching TV in this house with 3 TV's. We also provide the convenience of wireless internet for those of you who need to stay connected to work while on vacation. This home also has beautiful new windows and custom window treatments throughout. For those of you who like to exercise on your vacation we also provide bikes for our renters so that you may enjoy a leisurely bike ride on the cape. There's nothing like getting up early at the Cape and taking a bike ride or even a nice long walk along the beach. We also have beach gear such as chairs , beach umbrella, boogie boards and even sand toys! Hi Linda. We just got back from our week in Cape Cod. We had a wondeful time in DennisPort. We had a nice temperature...and the fish was deeeeeeeelicious ! Your house is fabulous ! Thank you for everything. Thank you again, with our best wishes ! Maria B. We just want to thank you for sharing your wonderful home with us.We all loved it and did not want to leave. Everything was great . One can see all of the love and effort that you put into this home. Kudos to you! We just wanted to write to let you know that we had a wonderful time at the house on Cape Cod last week! We couldn't have been happier with the location and the house itself - it was spotless, very nicely decorated, and clearly maintained with great care. We felt like we were staying at a friend's house rather than a summer rental!